The image above is a shot which, for many who visit the South Coast, is a familiar view. Yet for others, even those who often visit, the beautiful rock formation remains something of a mystery. So many are familiar with the Kiama blowhole, yet the amazing rock formations just a short drive away are far less known. Pulpit Rock, and the entire set of what are known as Cathedral Rocks, are located at Bombo, just a few minutes drive from Kiama. Like the Blow Hole itself, the rocks are the remains of ancient volcanic activity, forming from lava flows which solidified to rock. Over the millenia which have since passed by, the rocks have weathered into stunning shapes and rugged formations, which today evoke the feeling of a cathedral – hence their name. Many are unfamiliar with the striking rocks which shoot up from the sea bed, yet for well over 100 years, the area has been a popular destination for artists. As photography became a more accessible art form, photographers also made the trip to the area to capture shots of the stunning rocks and rushing sea around them. In fact, since the 1890s, the Cathedral Rocks have been bringing artists and photographers to the area to capture the rugged and ever changing landscape. With the holidays well and truly upon us, many people will be thinking of heading away for a family trip, often to the beach. Yet for those heading to the South Coast, the view in the image above might be a little different to the one they see today as they descend Bulli Pass! Bulli Pass was discovered in 1844, by Captain Westmacott, who had arrived in Australia in 1831 and taken up a grant in the Bulli area in 1836. He discovered the new route up the mountain above Bulli and gained support from both the local citizens and the government to build a road, then known as Westmacott’s Pass, along the route. Yet no vehicles used the road until 1868 because up until this time, it was little more than a track. The new road was shorter and safer than the old road to Bulli and soon became the main route to the Illawarra from the North. The road was sealed in 1926. Safe is a comparative word though! Throughout the history of the pass there have been runaway coaches and cars, lorries and trucks. In modern times, many of these have been accompanied by the smell of burning brakes! There have also been horse fatalities along the road, including Wirth Brothers circus horses hit by lightning. Perhaps the most interesting incident occurred in 1896 though, when an enraged bull escaped and took over the pass. It charged six pedestrians who escaped into the prickly blackberry bushes along the side of the road, and then overturned their carriage before it could be caught! This week, the weather has been quite lovely, with the days warm but not as hot as they have been. Should the weekend continue the trend, many people will be looking to spend some time in one of our wonderful National Parks, perhaps by or even on the water. Our National Parks have long been popular destinations for holidaying, or just for spending a day amongst Australia’s beautiful bush. Audley, in the Royal National Park, has long been one such tourist destination. The Royal National Park, established in 1879, is Australia’s oldest National Park, and is in fact very nearly the oldest National Park worldwide. Only Yellowstone in the US is older! 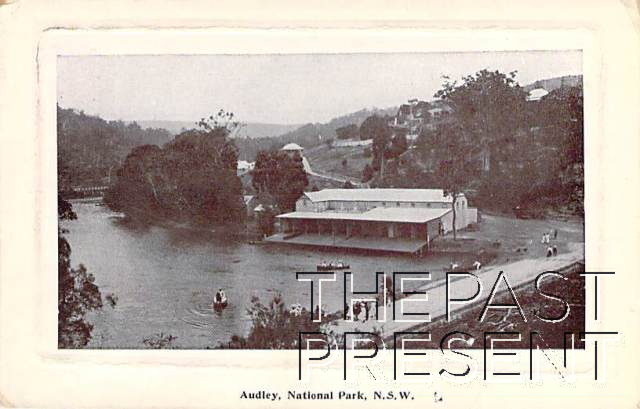 One of the most popular destinations within the park is Audley, with its weir and boatsheds. Originally, when the National Park was established, it was managed by the National Park Trust, who were given the powers to develop the park for the people of the colony. They set about building roads, and buildings, establishing gardens with exotic trees and even introducing animals! Most of the attention was focussed on the Audley area, where a small village of sorts was established in the style of a pleasure garden. A causeway was built to provide navigable water for boats, and a fresh water habitat for introduced fish. The area was landscaped with extensive lawns and paths, and a train line between Loftus and Audley was even installed to allow visitors to more easily access the area. By 1940, Audley was so popular that a proper dancehall was built! Today the Audley area continues to be popular with visitors, and you can still hire boats and enjoy the lawn areas of this historic spot. With holidays rapidly approaching and the June long weekend upon us, it seemed the perfect time to share the image above. 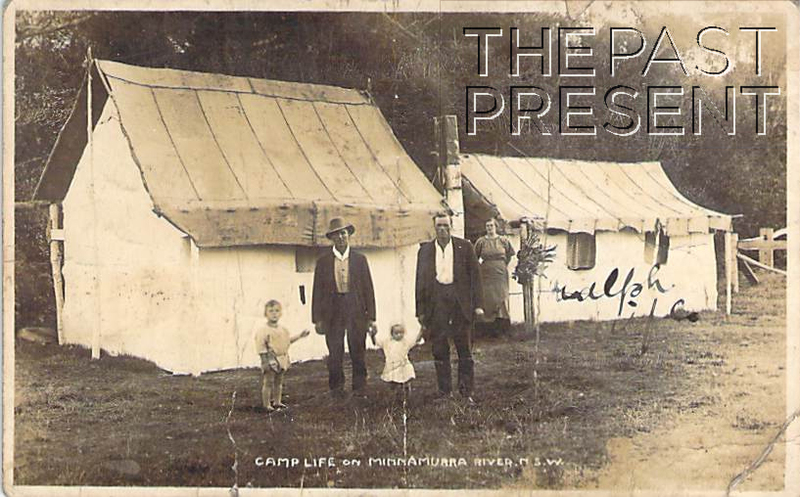 The image is an evocative glimpse of what camping in Australia, and particularly in the Illawarra area was like in the early 20th century. Camping has an incredibly long history in Australia. Aboriginal people lived in temporary dwellings, moving around the country from one place to another, while early European colonists often lived in tents of necessity. In fact the first fleet brought with it more than 600 tents! In the 1820s, people who visited Australia actually saw camping as the real Australian experience or the ‘Australian way’. History in Australia, an indeed the history of Australian development, is inescapably linked to camping. By the 1860s though, camping was beginning to take on a new dimension, people were choosing to set up temporary camps for recreation and holiday camping was born. Water, whether a coastal beach or quiet river meander was often a real feature of holiday camping, and even today many campers head to campgrounds on the coast or situated next to a picturesque river scene. The image above captures a camp along the Minnamurra River. Whether it depicts a temporary holiday camp, or something of a more permanent settlement is unknown, but certainly, it is a glimpse into a national pastime which has been with us since the very beginning. This week, The Past Present is heading South, to Port Kembla. 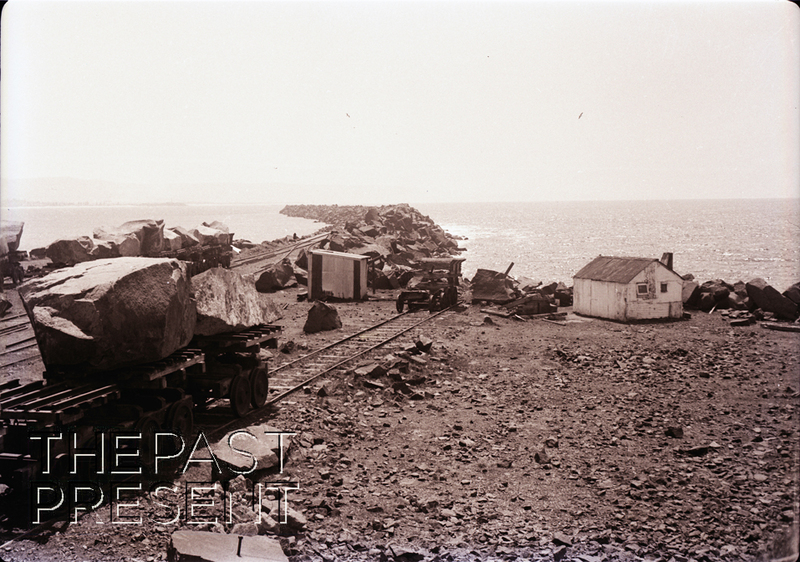 There are very few photos in the collection by an unknown photographer (taken circa 1936) which focus on this important industrial hub, but this photo showing the breakwater is a wonderful glimpse into the past. Port Kembla was originally known as Red Point and the land around the area was first granted to David Allen in 1817. At this time the land was used for farming, and the estate was actually called Illawarra Farm, but by 1883 the focus of the area had changed. Coal had been discovered at Mt Kembla, and a port was established at Red Point to allow the coal to be shipped. A tramway was constructed from the mine itself to the jetty in the port to allow efficient transport of the coal between the mountain mine and the sea port. It was probably the association with the Mt Kembla mine which caused the name of the area to change to Port Kembla, and the earliest reference to this name was in 1892. As time went by, Port Kembla became a more industrial hub and in the late 1890s the Mount Lyall Company built a coke works at Port Kembla itself. Soon it was proposed that an artificial harbour be built for the port and the Port Kembla Harbour Act was passed in December 1898, allowing two breakwaters to be constructed. These would provide protection for the ships using the port, but building the breakwaters would be a monumental effort – for every foot of breakwater 100 tons of rock was required.